Creative Habitat Children's Center is located on a residential street in Campbell, CA. Our tree lined setting offers a tranquil environment, with little vehicle traffic. 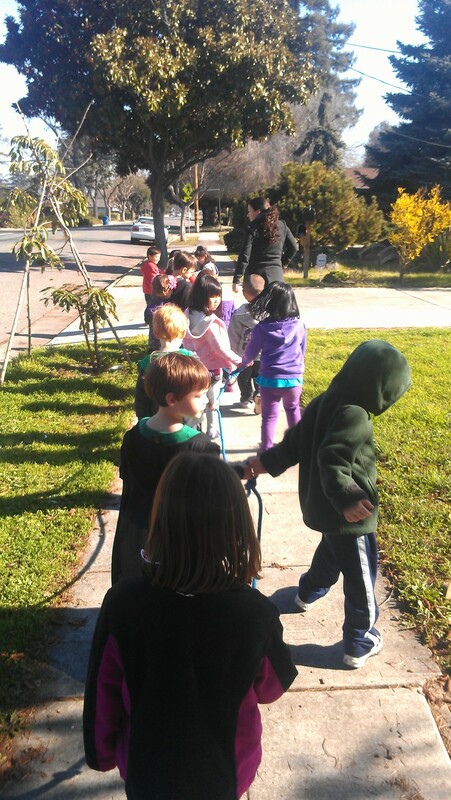 As a result, classes can go on walks through the neighborhood rather than be confined entirely to the playground. We also have "around the block" parades for the Fourth of July, Halloween, and other more spontaneous events. The building itself, encompasses about 6000 sq. ft of which 3500 sq. ft is activity area. The building was originally a convalescent hospital which gives it several unique architectural features. It has a large central hallway where physical education activities are conducted as well as events such as the school "feast" on Thanksgiving where all classes sit at a long communal table. All rooms have "Dutch doors" which allow the top half to be open while the bottom is closed. This permits viewing the classroom without having to enter and promotes free air flow through the building. We have three age appropriate playgrounds. There is ample shade, grass play areas, play structures with Fibar impact surfaces, and cement walks. The school is licensed for 100 children, 24 infants and toddlers, and 76 preschool children. Classes are assembled by age and each class has its own classroom. We are licensed to accept children from 4 months old to entry into first grade, which permits us to offer before and after school care to kindergarten students. The school is open from 7:00 AM to 6:00 PM, Monday through Friday. Tuition includes breakfast (before 8:00 AM), lunch, and an afternoon snack. Most of the students are full time but half day and part time schedules are available. Ratios for the infant and toddler rooms are 1 teacher to 4 children. We strive to keep the ratio for 2 year olds at 1 to 8, and 1 to 10 for the pre-k children, all lower than the state allowed ratio of 1 to 12. The fundamental core of the school is its director and teachers. Some of the teachers have been with the school since its inception and have over 20 years experience in early childhood education. They are all cheerful, friendly, and dedicated to the children. You may drop in for a tour at any time although tours from 11:00 to 3:00 are difficult as they impact lunch and the nap period. Prospective clients and their children may visit and spend time in their classroom prior to joining the school. Creative Habitat Children's Center is a safe and happy environment for your child. We know that choosing a preschool, even making the decision to send your child to preschool, can be difficult and stressful but we have a staff that is adept at welcoming your child and easing the transition.